Wedding planning is another of our “all-inclusive” services. From the moment you arrive, the stress-free fun begins. Simply choose a wedding package with the help of one of our experienced wedding planners and let us make your special day truly unforgettable. With a combined 40+ years of experience planning special moments exclusively at Couples Resorts, our three expert wedding planners - Kenisha Dell, Tia Rooney and Andrea Bruce - work a special kind of magic with brides and grooms planning destination weddings in Jamaica. Warm and enthusiastic, with a flair for flawless precision, this dynamic trio has earned the trust of couples year after year. In fact, many return regularly to relive the magic of “day one” all over again. 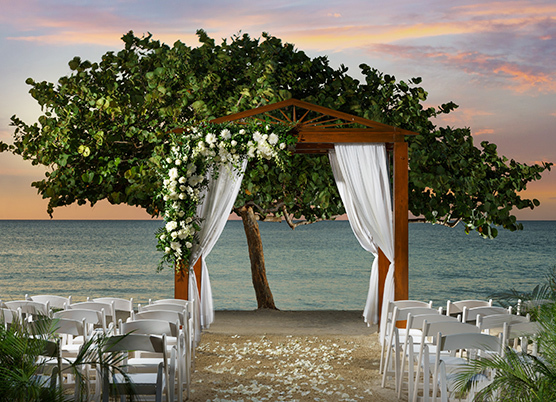 Have a question about planning a destination wedding in Jamaica? Please complete the form below (or call 1-800-Couples, Ext 5 or email weddings@couples.com) and be sure to visit our Wedding FAQs for answers to the most frequently asked questions!